World Translation Center can provide professional Kurdish translation services for English to Kurdish and Kurdish to English. We can also translate Kurdish to and from over 150 other languages, including all the principal languages of Europe, Asia, South America, the Middle East and a wide range of African languages, at competitive prices. Our Kurdish specialists will be able to provide translation for virtually any project you might have, including marketing materials, technical, financial, legal and medical documents, websites and software. Our skilled project managers will match your project with a translator team best suited for the area of expertise needed. Every linguist works exclusively in his or her own mother tongue and within his or her area of expertise guaranteeing not only quality translation, but proper localization as well. After each document is translated, it will be edited and proofread by another professional translator to assure maximum quality. We also make available transcription, video recording and subtitling services. In the event that you need to have an existing video dubbed, a commercial narrated or a telephone system recorded, our native Kurdish speakers are available to provide high quality voiceover services. Kurdish is spoken in Iraq, Turkey, Iran, Syria, Lebanon, Armenia, Georgia, Kyrgyzstan, Azerbaijan, Kazakhstan and Afghanistan. The Kurds are an Iranian-speaking group mostly inhabiting regions close to Iran, Iraq, Syria, and Turkey also known as Kurdistan. Kurdish communities also exist in Lebanon, Armenia, and Azerbaijan. Kurdish belongs to the northwestern sub-group of the Iranian languages, which themselves belong to the Indo-Iranian branch of the Indo-European language family. The most closely related languages to Kurdish are Balochi, Gileki and Talysh, all of which belong to the north-western branch of Iranian languages. Also related to Kurdish is the Persian language, which belongs to the south-western branch, especially the Lori and Bakhtiari dialects. Most Kurds also speak Arabic, Turkish and/or Persian as a second language. Kurdish Jews and some other Kurdish people usually speak Aramaic as their first language. Aramaic is a Semitic language related to Hebrew and Arabic, and not to Kurdish. 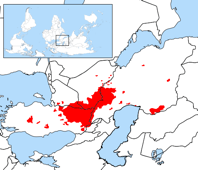 - The Kurmanji dialect group (the northern one) is spoken in the northern half of Iraqi Kurdistan, Caucasus, Turkey and Syria. - The Sorani dialect group (the central one), is spoken in west Iran and the central part of Iraqi Kurdistan. - Kurmanji and Sorani are really as different from each other as English and German. Kurmanji has grammatical gender and case-endings, Sorani does not. These two languages really only have their origin in common, not the language. In Turkey, Kurdish is written with the Latin alphabet and in parts of the former Soviet Union it is written with the Cyrillic alphabet. 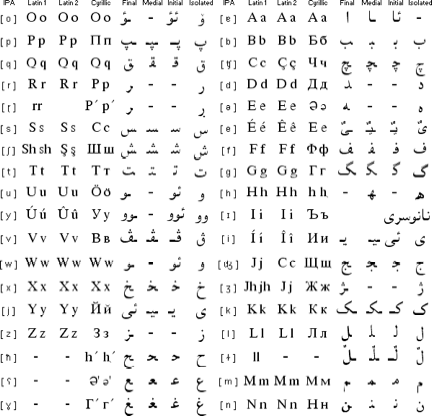 When Kurdish is written with the Arabic script, Arabic loan words retain their original spelling, however they are often pronounced quite differently in Kurdish.